LONDON – The Coen Brothers have taken Netflix for a ride with their anthology production ‘The Ballad of Buster Scruggs’. It’s a western ‘Tales of the Unexpected’ in which they have dusted off some mostly hoary old story ideas and spent a lot of money on a great cast and crew and wonderful locations. Sadly, only one of the yarns reaches the level expected from the Coens and the others probably would never have seen the light of day without the streaming service’s desperate need for big names. No doubt the Coens were happy to take all that money for old rope and what seems most evident in the six short films that make up the production is that everyone appears to have had a great time. The opening sequence, which gives the film its title, is the only one worth seeing as it displays the brothers’ wit and whimsy and taste for fantasy and offbeat violence. 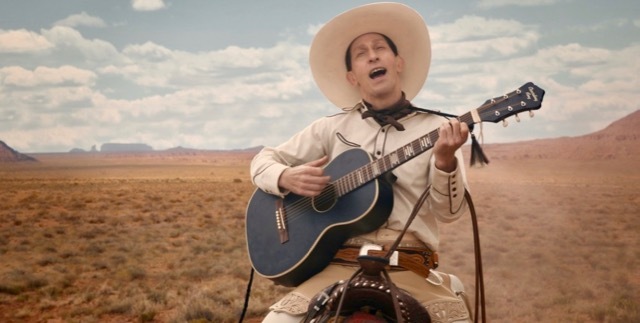 Tim Blake Nelson (above) plays Buster, a singing cowboy who narrates his own fable and is gradually revealed to be a fatalistic psychotic killer who seeks only the next gunfight. It’s wickedly funny. That cannot be said of the five other predictable yarns introduced by the flickering pages of an old book of western stories. 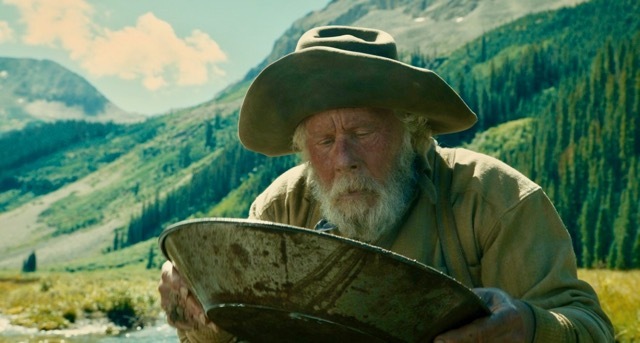 James Franco plays a hapless bank robber in one sequence, Liam Neeson is a frontier impresario who reconsiders his meal ticket in another, and Tom Waits (above) is a resourceful miner in the fourth. The fifth is a longer piece about a young woman (Zoe Kazan, with Bill Heck below) facing peril on a wagon train and the last is about a stagecoach ride to nowhere on a theme treated more brilliantly in the Monty Python sketch in which ‘to serve salmon with botulism at a dinner party is social death’. All the actors are just fine, Blake Nelson especially, and cinematographer Bruno Delbonnel and production designer Jess Gonchor make the most of the splendid locations in Sioux County and Scotts Bluff County, Nebraska, and near Albuquerque, New Mexico. Carter Burwell’s music ups the IQ of the lesser sequences with his usual flare. All the stories dwell on mostly forlorn hopes but the biting wit of the first story is sadly missing from the others. If the Coens want to find terrific source material for a truly colourful and accurate depiction of the Old West, they should look no further than the great Texas writer Larry McMurtry’s wonderful collection, ‘The Berrybender Narratives’. Now they are ballads worth singing about. Screened in London; Streamed on Netflix: Nov. 9; Cast: Tim Blake Nelson, Liam Neeson, James Franco, Zoe Kazan, Clancy Brown, Brendan Gleeson, Stephen Root, Tom Waits, Tyne Daly, Saul Rubinek, Bill Heck, Jiji Hise, Grainger Hines; Directors, writers, editors: Ethan Coen, Joel Coen; Director of photography: Bruno Delbonnel; Production designer: Jess Gonchor; Music: Carter Burwell; Costume designer: Mary Zophres; Producers: Ethan Coen, Joel Coen, Megan Ellison, Sue Naegle; Production: Annapurna Pictures, Annapurna Television, Mike Zoss Productions; running time 131 minutes. This entry was posted in Reviews, Television and tagged 'The Ballad of Buster Scruggs', Bruno Delbonnel, Carter Burwell, Coen Brothers, Jess Gonchor, Liam Neeson, Netflix, Tim Blake Nelson, Tom Waits. Bookmark the permalink.